Showing 46 articles from February 19, 2014. LOUISBURG — It wasn’t exactly clear what route N.C. Transportation Secretary Tony Tata took to get to Louisburg College on Wednesday morning. After a two-hour meeting, though, it was clear that he would be taking U.S. 401 back to his staff and the governor with a definitive message — stakeholders in this region want the roadway widened and improved. LOUISBURG — Commissioners refused to issue a special-use permit for a solar farm they said would harm a residential neighborhood. Green Energy Development LLC proposed erecting a solar farm on 15 acres of a 46-acre tract on Cedar Creek Road near Franklinton High School. 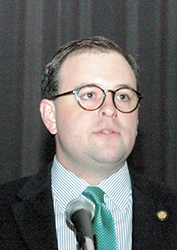 The county’s planning board, though, urged the board to deny the petition during a January vote on the matter. 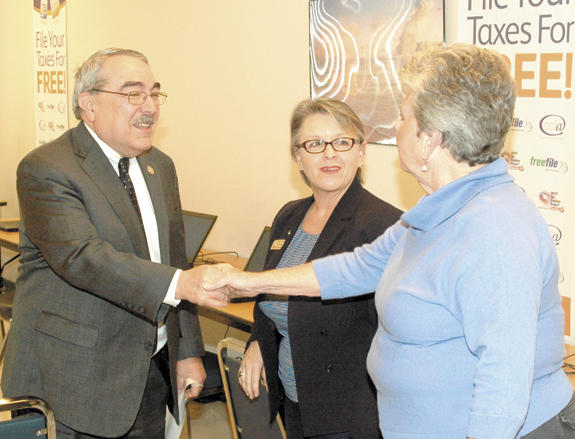 Rep. G.K. Butterfield, left, meets with County Manager Angela Harris, center, and Louisburg Town Councilwoman Emma Ruth Stewart, during a presentation about the IRS and North Carolina Free File programs. It was held at Vance-Granville Community College, hosted by Franklin-Vance-Warren Opportunity Inc.
YOUNGSVILLE — Parks and recreation programs, ultimately, teach kids how to play within the rules. If the town’s Board of Commissioners agrees, parents and coaches will have to learn to do the same. When Pete Gibson took over the town’s parks and rec department in December, he knew he wanted to establish a written code of conduct and ethics for both parents and coaches. LOUISBURG — A Louisburg man turned himself in to authorities following a weekend shooting. According to a report by Officer T.W. Lincoln, Ledaryenne M. Smith and Deshawn M. Conyers got into an altercation at an apartment in the 200 block of Cooper Street the afternoon of Feb. 15. Chief Rick Lassiter said Smith pulled out a 9mm handgun and shot Conyers two times in the chest area. There’s a good chance that areawide LED lighting will be coming to a backyard near you soon -- if it hasn’t already. The Louisburg Town Council agreed Monday night to work up the numbers to analyze a proposed switch from sodium vapor lights to the new LED technology after hearing a presentation from Robbie Tugwell of Power Secure, Inc., of Wake Forest. Whew! I think I discovered something worse than Chinese water torture or water boarding. It would be being forced to watch the non-stop “snow-babble” broadcast by this area’s television stations during a wee storm that caused problems for a few hours last week. Fortunately, I didn’t have to watch much of that since I still remember where the “off” switch is located. You’ve heard a great deal about pay raises for teachers lately, mostly from the folks in Raleigh who have caught a fair amount of flak over the issue, both from teachers and those who believe public education must be among our state’s top priorities. But teacher pay increases aren’t the only issue facing public education in this state and, honestly, probably not the biggest issue, either. Sometimes, one person can make a difference. 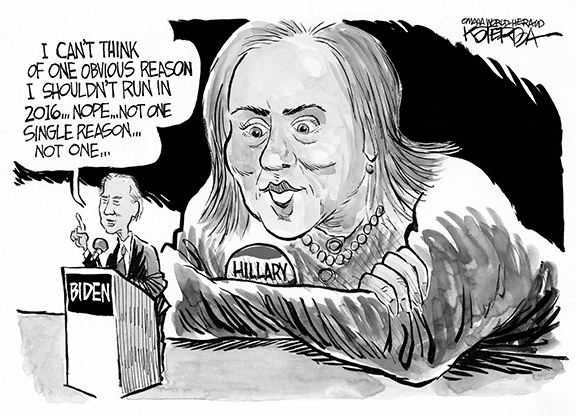 More importantly, seven others — with decision-making power — agreed. Earlier this week, a Raleigh company, Green Energy Development LLC, petitioned the board, asking for a special-use permit to erect a solar farm on Cedar Creek Road near Franklinton High School. Declassifying DENR officers an effort to lessen enforcement? I recently watched the 1973 movie “Serpico” again. That is something old guys do, watch movies we saw years ago. A major part of the plot is that the crooks in New York City aren’t afraid of getting arrested because they have the police on their payroll. 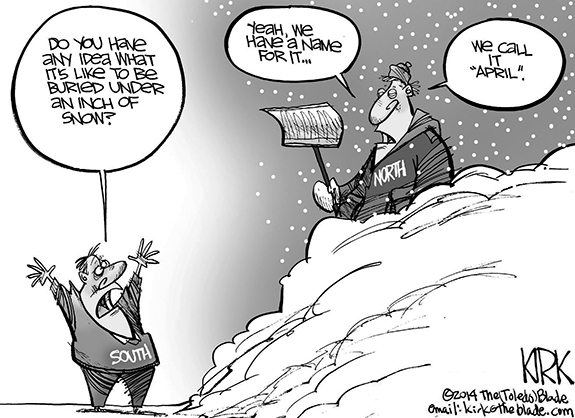 Fast forward to 2014 and North Carolina; the premise is the same except the bad guys’ methodology is even more insidious. I commend Ned Barnett for his thought provoking opinion piece in The News & Observer, (“A Moral Monday opponent makes his case,” Feb. 16.) Barnett is correct in saying that the anonymous writer “should see himself in the crowd on Fayetteville Street” instead of identifying with and voting for those whose policies favor people who are much wealthier. FRANKLINTON— Funeral services for Charlie T. Edwards, 78, who died Thursday, Feb. 13, 2014, will be held Thursday, Feb. 20, at 2 p.m. at Allen Metropolitan AME Zion Church in Franklinton. Burial will follow in Evergreen Cemetery. YOUNGSVILLE —Chase Hinnant, 18, died Monday, Feb. 17, 2014. He was a student at Wake Tech, North Campus. A memorial service will be held at 1 p.m. Saturday, Feb. 22, at Stony Hill Baptist Church, Wake Forest. Inurnment will follow at Bethany Baptist Church Cemetery, Wendell. FRANKLINTON —Joaquin (Jack) Munoz, 87, of Wilmington, N.C., died Thursday, Feb. 13, 2014 at his home. Funeral services were held Wednesday, Feb. 19, at Manasseh Chapel Baptist Church, Franklinton, with the Rev. Samuel T. Tunstall officiating. Interment followed in the church cemetery. LOUISBURG - Mary Frances Strickland, 76, of Louisburg died Thursday, Feb. 13, 2014 at her home. JACKSONVILLE, AR— Shelley Lee Kelly, 68, of Jacksonville, AR died Jan. 24, 2014. He was a veteran of the United States Air Force who had two tours of duty in Vietnam. He served as a Senior Master Sergeant for 23 years until retirement. Following this, he returned to the LRAFB as civilian instructor with the Lockheed Martin Corporation. ON-TIME DELIVERY. East Carolina University’s Tyler Bolton sends a pitch toward home plate during Sunday’s victory against James Madison. 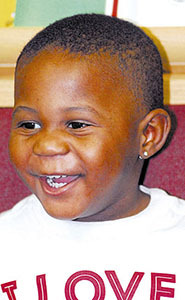 Bolton grew up in Louisburg and attended Kerr-Vance Academy in Henderson. 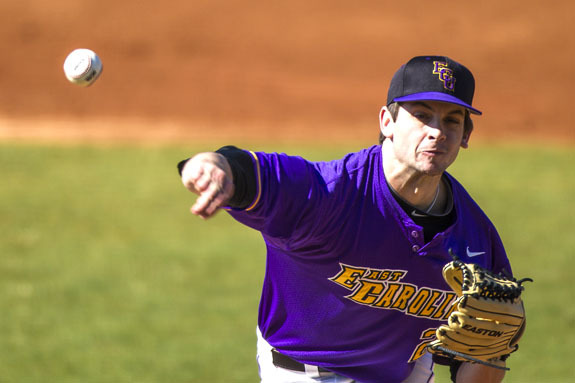 GREENVILLE -- Senior Ryan Williams tossed four scoreless innings of relief, while freshman Kirk Morgan recorded two hits including the game-winner lifting East Carolina University (2-1) to a 4-2 Opening Weekend baseball series win over James Madison (1-2) Sunday afternoon at Lewis Field inside Clark-LeClair Stadium. The Pirates, who notched their seventh straight series win dating back to 2013, broke a one-all tie in the fourth frame scoring a pair of runs for a 3-1 advantage. AARON ON THE MARK. 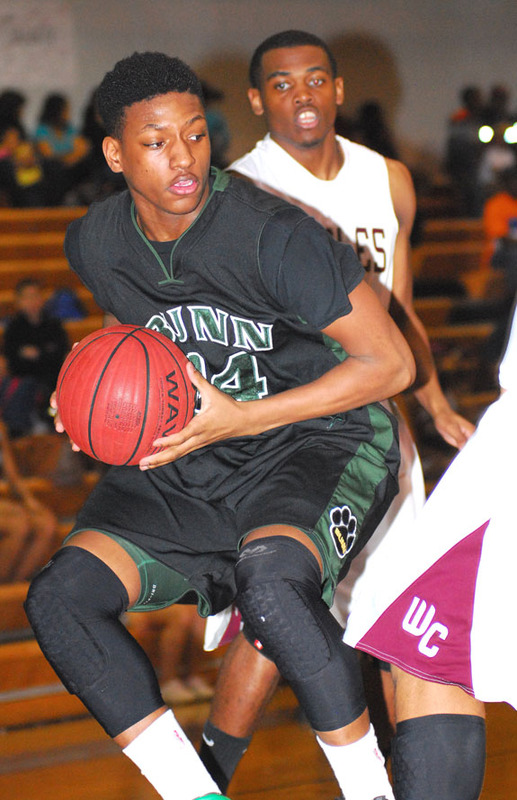 Bunn’s Aaron Simmons scores inside during Tuesday night’s road boys basketball decision at league opponent Warren County. WARRENTON - With no gauge to go by, Bunn’s Gerald Melton’s isn’t exactly sure how his club will respond to what will undoubtedly be the most challenging 96 hours of the boys basketball season. Despite a lifetime of experience, Melton has never been part of a team that has been forced to play four games in four days due to recent poor weather. TWO FOR TETYANA. 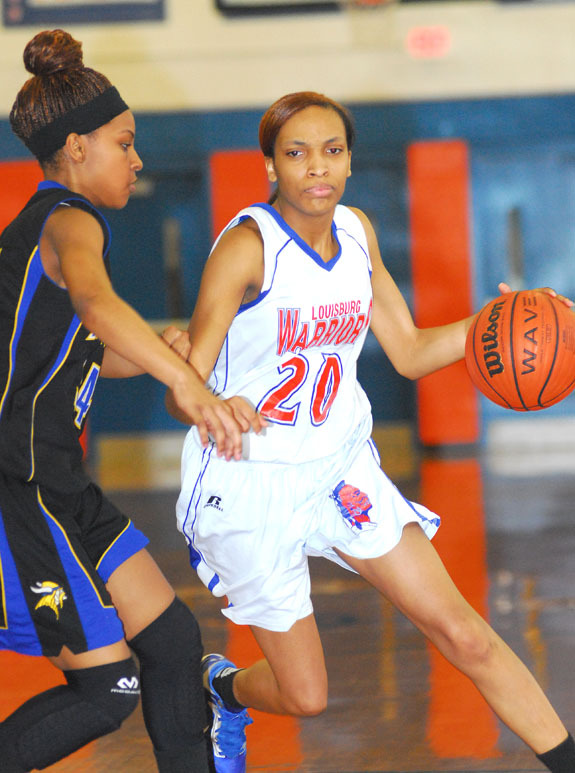 Louisburg High School’s Tetyana Seda drives for a basket during last Saturday’s home loss to Northwest Halifax. LOUISBURG -- In order to keep their season alive, the Louisburg Lady Warriors needed to stop a team -- Northwest Halifax -- that they had lost to just 72 hours earlier. But LHS was able to achieve that goal, nailing several key trifectas during the decisive second half in Tuesday’s opening round of the Tar-Roanoke Athletic Conference Girls Basketball Tournament at Weldon High School. THREE IS A LUCKY NUMBER. Louisburg College’s Kendall Isler looks for an open teammate during Sunday’s home hoops decision against Bryant and Stratton College. 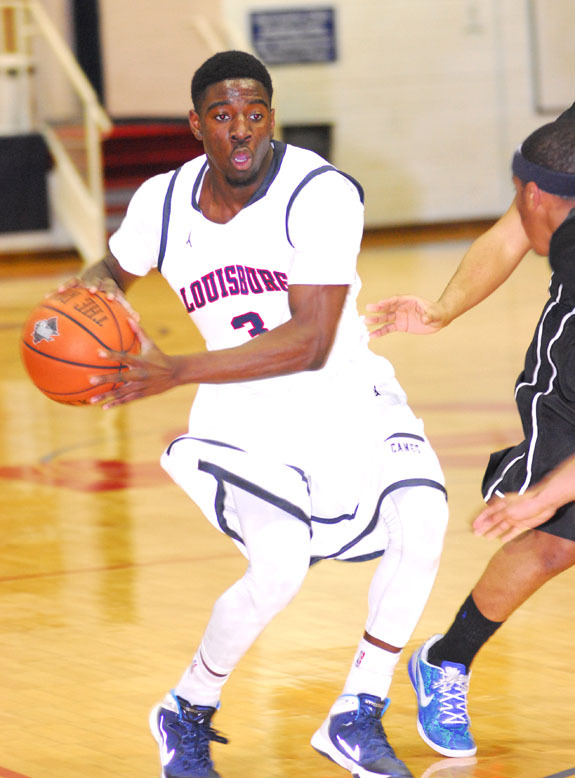 LOUISBURG -- Louisburg College’s tradition-rich men’s basketball program finds itself in a rare recent position heading into the final two weeks of the regular season. LC, which was won four consecutive Region X Tournaments, is one game behind Richard Bland in the league standings with four contests remaining -- including the season finale against RB next Saturday at home. DON’T PASS ME BY. 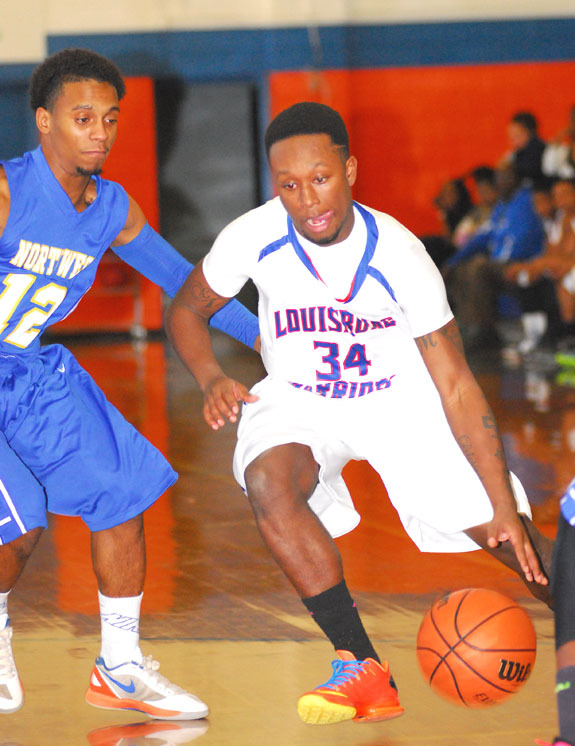 Louisburg High School’s Nick McCalston (right) drives for the Warriors during last Saturday afternoon’s triumph against Northwest Halifax in TRAC action at the LHS Gymnasium. LOUISBURG -- At the time, the Louisburg High School Warriors had no idea the ultimate importance level of last Saturday’s home victory against Northwest Halifax. LHS would win that game, but fell two nights later at Weldon in the final regular season boys basketball event in the Tar-Roanoke Athletic Conference. STUDY OF INTENSITY. 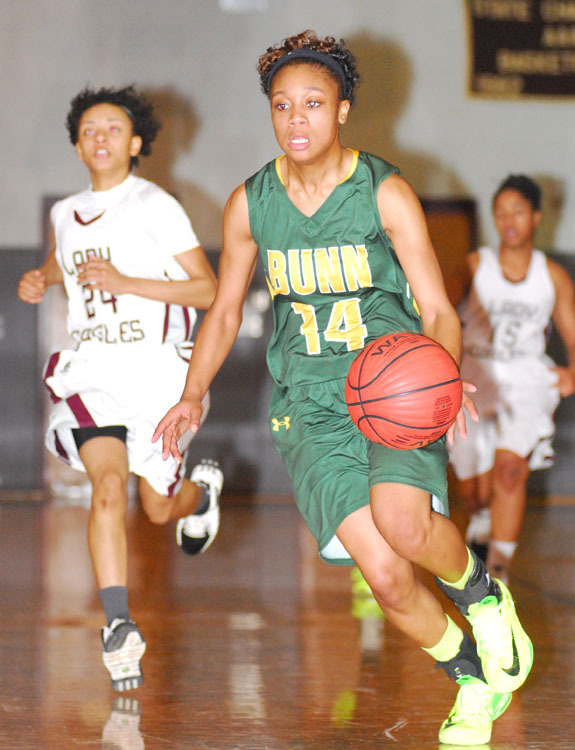 Bunn’s Tainasha Vines drives for two points on Tuesday night against league foe Warren County. WARRENTON -- A grueling week for the Bunn Ladycats began with a test Tuesday night at Warren County. WCHS head coach Shannon Jones had her team prepared for the Northern Carolina Conference contest against the Ladycats, who needed to win in order to remain in the race for the NCC regular season crown. At halftime, Bunn was actually behind, but the Ladycats picked up the defensive pressure in the second half en route to earning a 50-35 triumph. ZEBULON -- The Carolina Mudcats’ annual National Anthem Tryouts are scheduled for March 22 at 9 a.m. at Five County Stadium. Tryouts will be held from 9 a.m.-Noon. Registration will begin at 8:30 a.m. on the third-base side of the stadium. Auditions will be held first-come, first-served. JUST TREY-MENDOUS. 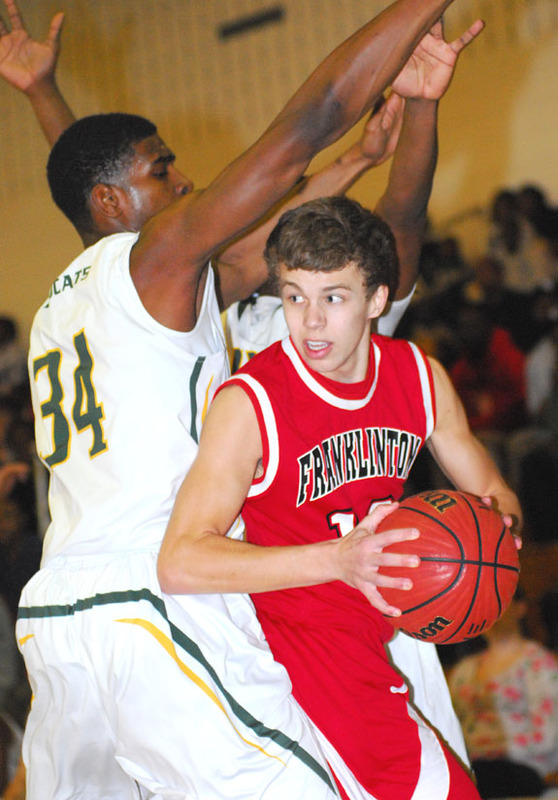 Cole Gupton’s heroics from the 3-point line helped Frankliknton High School secure a boys basketball victory Tuesday night at Roanoke Rapids. FRANKLIN COUNTY -- It was a banner performance for Franklin County mat stars during regional wrestling competition last weekend. At the Class 2-A Mideast Regionals at Wheatmore High School (in the Triad), athletes were tested because the event, which is usually two days, was shortened to one day because of recent poor weather. 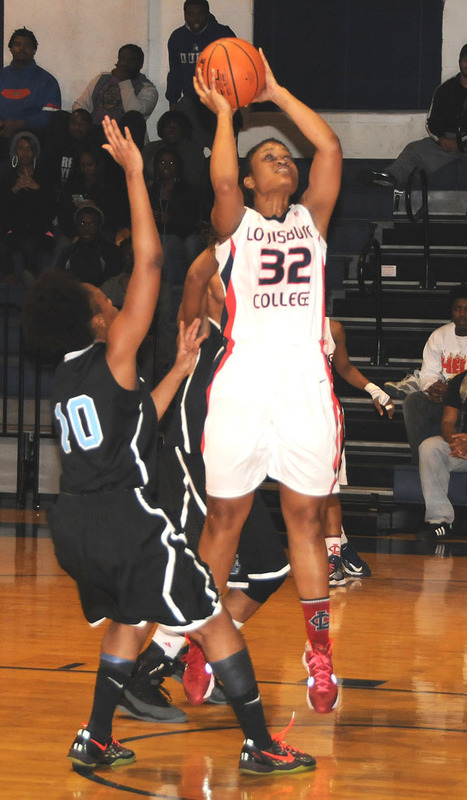 LOUISBURG -- For the third straight night, the Louisburg College Lady Canes basketball team hit the hardwood for a Region X game, and as they did Saturday and Sunday, Louisburg came out on top by defeating Lenoir CC, 76-70 on Monday at Taylor Center on the LC campus. The three conference wins up LC’s Region X record to 8-3, 15-5 overall. BUNN -- The Bunn Youth Recreation League is currently conducting registration for its Spring Sports Leagues. BYRL will host baseball, softball and T-Ball leagues. 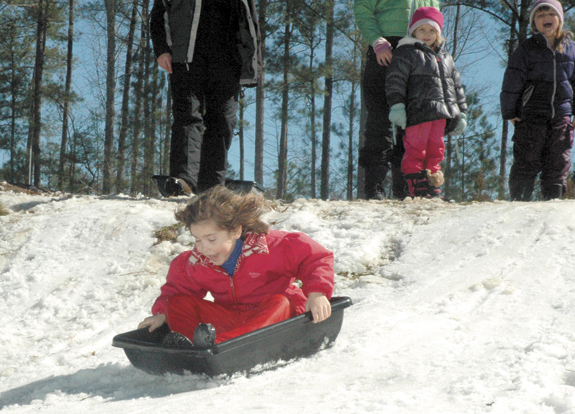 Registration will be held through March 1 at Bunn Elementary School. Times are 6-8 p.m. every weekday except Wednesday, and also on Saturdays from 10 a.m-2 p.m.
ROCKY MOUNT -- Senior Josh Morrison eclipsed the 1,000-point mark for his career las Saturday afternoon, helping his North Carolina Wesleyan Battling Bishops to a 81-66 victory over visiting Greensboro College in USA South Conference men’s basketball play. Needing 13 points, Morrison’s milestone basket came with 2:48 left in the first half. 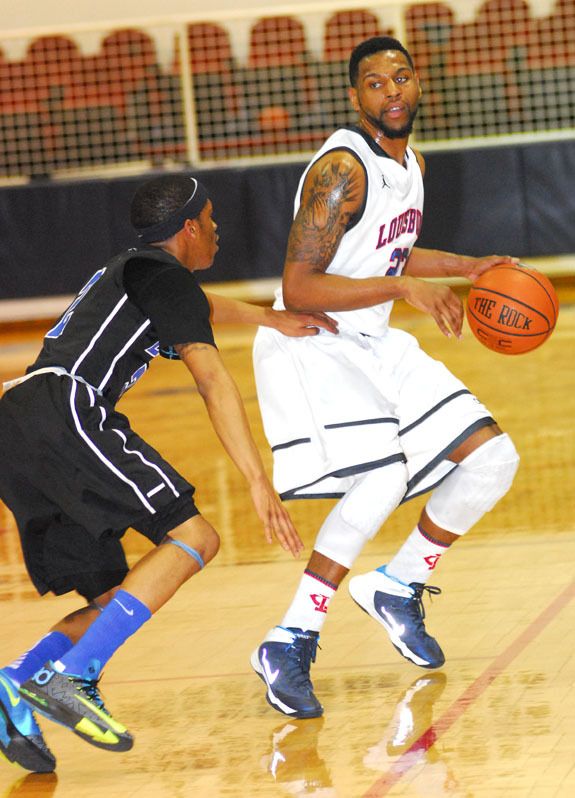 Louisburg’s Alkia Johnson (with ball) drives for a basket during last Saturday’s home basketball game. 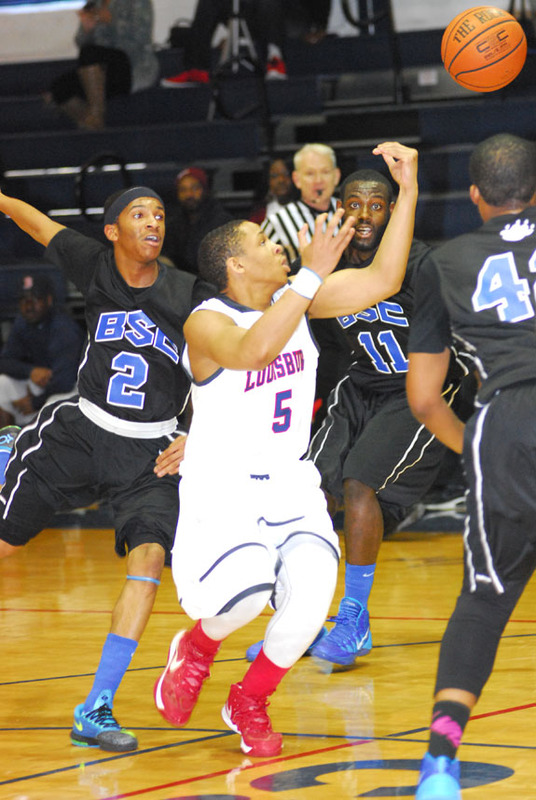 Louisburg College’s Kadarius Turner (5) tries to come up with a loose ball while being surrounded by a trio of Bryant & Stratton players during Sunday’s men’s basketball contest at Taylor Center. 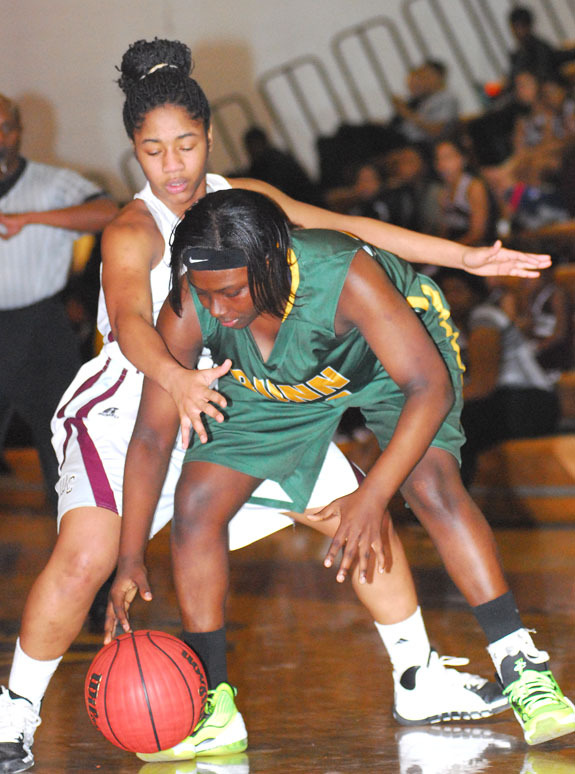 Bunn’s Casandra Key (with ball) tries to avoid some strong Warren County defense during Tuesday’s matchup. 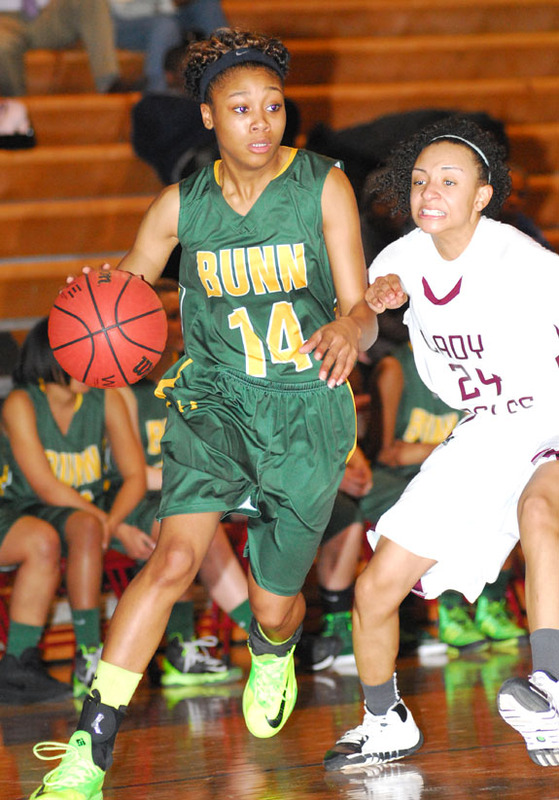 Bunn’s Tainasha Vines heads for yet another basket. Louisburg College’s Trey Brown (right) prepares to drive for a basket during the Hurricanes’ home victory Sunday afternoon against Bryant & Stratton. The Tar River Center for History and Culture at Louisburg College recently acquired several buttons from the 1916 gubernatorial campaign of Thomas Walter Bickett (1869-1921). Christy Ann Pippin and Christopher John Wilder were married during a 5 p.m. ceremony on Saturday, Oct. 5, 2013 at Bunn United Methodist Church. The minister, Pastor Dave Bundy, not only recognized the marriage of the bride and groom, but the uniting of them and their children as one family. The bride is the daughter of Wayne and Linda Pippin of Bunn. 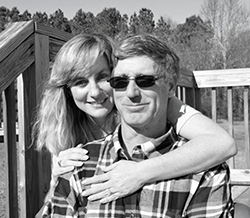 Melody and Leonard Jarman of Louisburg, and Michael and Diana Mowery of Grove City, Ohio, announce the engagement of their daughter, Mary Renee Crotts of Louisburg, to John Rusty Creekmore of Nashville. He is the son of Everette and Ann Creekmore of Louisburg. 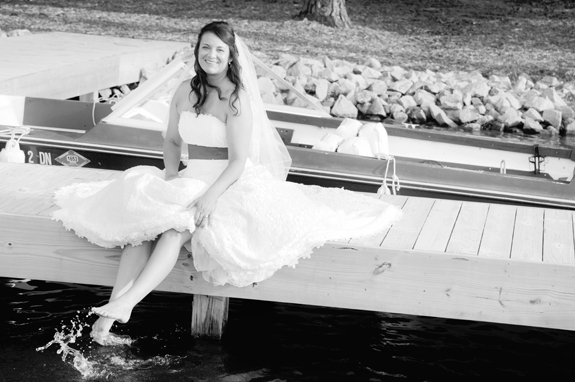 The wedding is planned for March 15, 2014 at White Level Community Holiness Church. FRANKLIN COUNTY — Franklin County was blanketed by a snow storm that shuttered schools, closed down municipal governments, paralyzed travel and caused emergency directors to open a shelter. And while the storm, that swept through the county the afternoon of Feb. 12, knocked out some power and caused a few wrecks, the county escaped any serious problems, according to authorities. The conference will be held at the Vance-Granville Community College multi-purpose building in Louisburg. 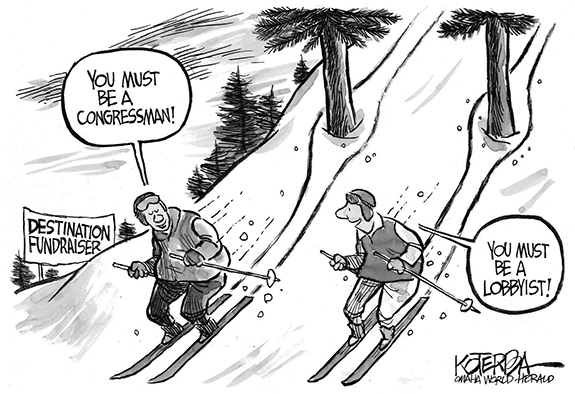 Registration will begin at 8 a.m. with the program starting at 9 a.m.
AT WORK AND PLAY IN THE SNOW. 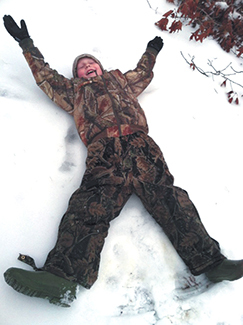 Ethan Creech, 8, makes a snow angel at a home on Balance Rock Road in northern Franklin County. AT WORK AND PLAY IN THE SNOW. 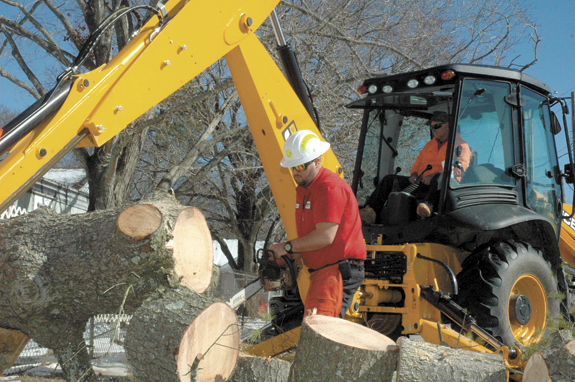 Franklinton Public Works Director Josh Bennett cuts up a tree that snapped a power line near Franklinton Middle School’s gym. Meghan Scott Ayscue of Louisburg and K.C. Spangle of Zebulon were among the 151 North Carolina candidates who successfully completed the Uniform CPA Examination during the period October-December 2013. The successful Uniform CPA Examination candidates must now meet the education, work experience, and moral character requirements of the Board to become licensed as CPAs in the State of North Carolina.